Why do attorneys join the ARAG network? 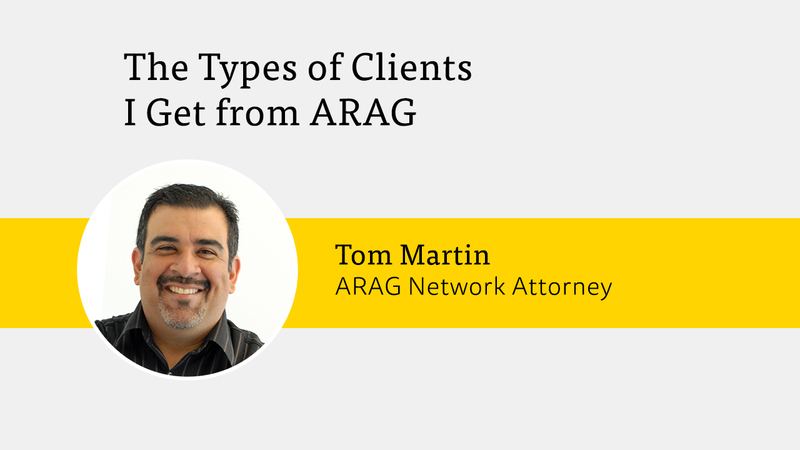 Join the ARAG network and connect with clients who have a specific need in your area of law. You can experience supplemental growth to your client base while we help you tackle time-consuming administrative tasks. Expand your client base without added cost. Get paid directly by ARAG. Easily manage cases and billing. Increase your online visibility with clients. Choose the areas of law you want to provide so you can grow your practice intentionally. *2016 ARAG Plan Member Survey. How does ARAG legal insurance work? Legal insurance works a lot like the health insurance model. Employees sign up for ARAG legal insurance as a benefit through their employer and pay an affordable monthly premium to access a network of attorneys. For covered legal matters, you provide client services, submit your claim to ARAG and get paid directly from ARAG. How does ARAG connect me with clients? When ARAG members need legal help, they primarily connect with you in three ways. View attorney profiles on ARAG’s website and/or Legal app and contact ARAG to be connected to an attorney of their choice. Call Customer Care to get help connecting with a network attorney. Contact you and provide case confirmation details so you can start working with them. Prior to accepting a case, you’ll receive vital details so you can determine if the case is a good fit for you. Once you’ve decided to move forward with representation the ARAG member becomes your client. Members have the ability to access an attorney within 30 miles of their home or work. What to expect when you join the network. ARAG credentials and selects attorneys individually so you can be sure you’re in good company. A service and payment agreement (contract) with ARAG. Access to a secure online attorney portal to manage cases, submit payment requests and access agreements, communications and other resources. The ability to create your individual profile details, including the areas of law you want to provide to ARAG clients, your photo, office location, personal interests and more. Payment details up front, and listed on the ARAG CaseAssist form, based on the type of coverage available. Network attorneys receive payment based on the client’s level of coverage. Receive payment directly from ARAG within 10 business days for covered legal matters. Paid to you directly by ARAG. 75% of your regular fee. You bill the client directly. Paid by the client. Additional attorney’s fees are paid by ARAG. Licensed to practice and in good standing with the regulatory authority in the state(s) where you accept clients (unless you only focus on immigration or federal matters). Maintain physical office space in the state(s) where you’re licensed and practicing law. Agree to provide services to ARAG members for covered matters based on the Network Agreement. To view opportunities in your area, enter your zip code and choose the types of legal services you’re interested in providing to ARAG clients. We’ll provide an estimate of ARAG members in your area and earning potential for different legal services. ARAG’s agreements are at an individual level, not the firm level. By working with individual attorneys, we increase your visibility to our plan members and ensure our members are working with attorneys who meet the requirements to join the network. We are proud to champion solo and small practice attorneys with the goal of connecting them with people who need their help to close the access to justice gap in America. 1. Credibility and accountability are our priority. Our insurance plans meet stringent federal and state regulations and we maintain the highest levels of service to meet the requirements of employers in the United States. 2. We make administration easy. With online payments and claims administration. Plus, our customer care and dedicated attorney experience teams support your work with ARAG clients. 3. You get feedback directly from ARAG clients. This helps ensure you’re providing the best experience to all your clients. Get the benefit of their input without having to manage the process. 4. Stay up to date on the latest legal industry news. Our thought leadership webinars and exclusive content from leading influencers in legal tech, customer service and entrepreneurship. 5. ARAG cares about and advocates for attorneys. We believe you are a critical to improving access to justice in America and are always working to provide affordable access to legal help.